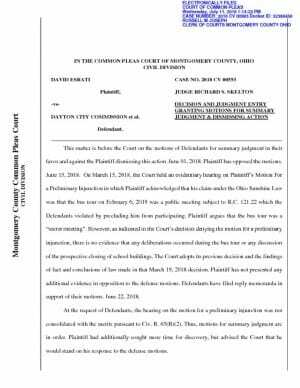 Today Judge Richard Skelton dismissed the case Esrati vs DPS and Dayton City Commission on imaginary legal precedent. There is no provision in ORC 121.22 to qualify meetings based on if deliberations took place. Common sense also says, you can’t prove what did or did not happen in a meeting if you can’t enter the room. The video of the actual actions of the task force was in evidence, but never reviewed. The problem with the OMA is that our legislators in Columbus who wrote it, and then kept adding to it, would flunk the third grade reading guarantee. It’s a bunch of convoluted language with references to penalties that never get handed out- mostly because they really don’t want the public to use it to guarantee open honest government. I’m not going to recount the whole argument- but, I originally filed to stop the bus tour, because that was pressing. I should have filed a simple OMA case- for all the violations- the attempts to throw me out, the actual keeping me out, the banning of audio and video recording equipment. Those are all punishable violations. I will appeal the case, and hopefully, smarter judges will understand that laws that are only enforceable by lawyers – to protect the general public from bad behavior of people in power, aren’t really protecting anyone. It’s too bad Skelton never watched the video evidence that the School board lawyer denied the existence of. Because if he had watched it- a 3rd grader would have seen that there was a violation. Here’s his decision for summary judgement for the defense. You mean to tell me that David Earati knows more about the law than a judge who has their JD, and spent their career in the law? Can the district sue Esrati for their legal costs? If so, I would certainly hope they do. This was a waste of tax-payer money and Mr Esrati should compensate the taxpayers as such. Mr Esrati, you have lost. As an aside, I am pleased this case is over and my tax dollars will no longer be spent to massage a fragile egomaniac. @David Johns what part of “appeal” don’t you understand? I know you’re a moron to begin with, but, this case isn’t over. David Johns is a troll. A troll with a man-crush on Esrati. David Johns – Have you ever attended any training on the Open Meetings Act? Have you ever been involved in any court proceedings? Have you ever dealt with lawyers and/or judges. I can answer “Yes” to all of those questions. And, I can also assure you that many lawyers and/or judges aren’t really all that smart. So, is Esrati probably more familiar with the OMA than the judge? There’s a pretty good chance that the answer to that question is also “Yes”. The “Ohio Ethics Commission” will also tell you that it’s important to avoid the APPEARANCE of impropriety when there’s a gathering of elected officials (ie – the school board). That clearly wasn’t done if the Board got on the bus where members of the general public or the press were not allowed to ride along. Quite frankly, David Johns, how often do you think it’s OK to have elected officials ignore the law – whether it’s the OMA or any other law? Do you think it’s OK? It certainly appears so. If it was some other “watchdog group” other than Esrati pursuing this, would you be so vocally opposed? You’re right. Judge Skelton should be ashamed. If one watches the video of the court proceedings, one can see the incompetence of the Judge. He kept asking the lawyers for the city and the school board what they thought. It was quite obvious that he was presiding over an issue that he knew little or anything about. Why have the law on the books if a concerned citizen can not get relief from the court when the rights of the public have been violated? We all should remember his name when he comes up for re-election. Just watched the video. Sheesh! What a bunch of clowns. One could argue that it wasn’t necessarily a true “public meeting” since there wasn’t a quorum of any single elected body present… BUT if they didn’t bring that up in their defense, then that tells me that their legal counsel believes that it was a public meeting subject to the OMA. I would tend to agree with that view given that they are a body tasked with deciding policy having to do with public assets (buildings, money, etc.) and telegraphing their recommendations to various public bodies. Additionally, one would expect that the individual members of the task force that are elected officials will be discussing these tours/discussions/recommendations with the members of their boards in public, open meetings. Therefore, if the defendants would argue that the task force is not a public body, I would think that the “round robin” provisions of the OMA would come into play here. What’s truly a shame is that Marsha Bonhart – a former journalist that supposedly believes in the First Amendment – would be a willing participant in this debacle. Ditto for the DDN “reporter”. Of course, he doesn’t want his access to this circus cut off. But, shame on him for having no principles!! Why haven’t you reported Montgomery County to the Ohio Ethics Commission? They’re bad, bro. Have they rescheduled the appeals date? Tuesday, March 5th at 10am is the oral arguments in the appeal.